The National Reverse Mortgage Lenders Association welcomed new board members during its recent annual meeting in late October, and bid farewell to several long standing board members who are leaving their posts. Leadership also pointed to some of the work NRMLA has done over the last year, and continues to approach in the coming months. During the meeting, held in San Diego, NRMLA leadership and board co-chairmen Joe Demarkey and Reza Jahangiri thanked Sherry Apanay of Finance of America Reverse, Paul Fiore of AAG and Mark Browning of HomeChex for their service, and introduced the 2018-2019 board. They also noted some of the priorities for the association at present time. 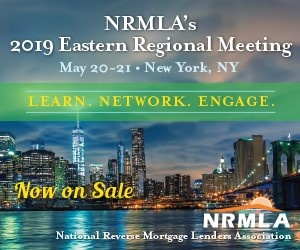 Among the areas NRMLA has been focused on are communicating with the Department of Housing and Urban Development as well as members of Congress, and finding ways to protect the Federal Housing Administration’s Mutual Mortgage Insurance Fund and reduce volatility within it. Co-chair Reza Jahangiri, CEO and founder of AAG, echoed comments about the recent changes, noting that innovation has been positive for the industry, despite causing some pain points. At the same time, originators have felt a lot of pain the process, he said.